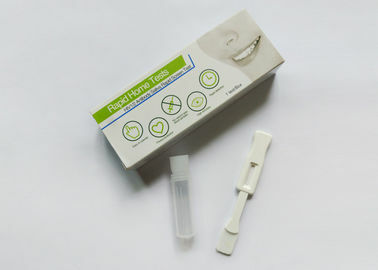 The HIV Oral fluid self test kit is a point-of-care test to aid in the diagnosis of infection with HIV-1 and HIV-2. This rapid HIV test provides results with 99.30% accuracy from oral fluid in as little as 20 minutes, thus providing results during the initial visit and enabling immediate counseling. Additionally, this test will be useful for pregnant women who do not know their HIV status at the time of delivery and for health care workers after accidental exposures to body fluids from infected individuals. 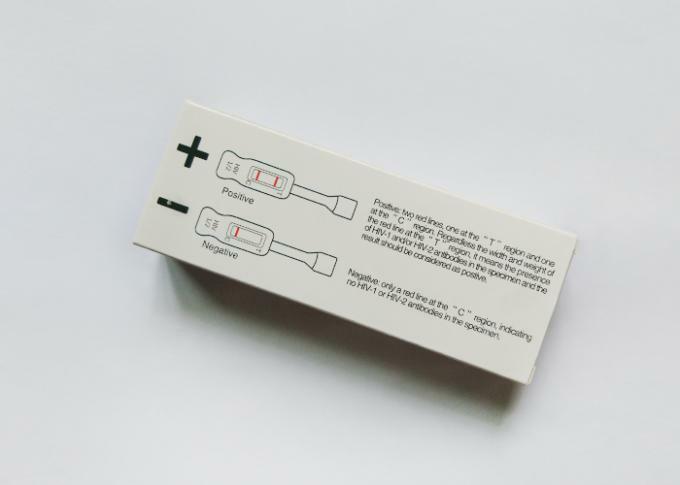 The HIV Oral fluid self test kit utilizes a proprietary lateral flow immunoassay procedure. The device’s plastic housing holds an assay test strip comprised of several materials that provide the matrix for the immunochromatography of the specimen and the platform for indication of the test results. The assay test strip, which can be viewed through the test device result window, contains synthetic peptides representing the HIV envelope region in the Test (T) zone and a goat anti-human IgG in the Control (C) zone immobilized onto a nitrocellulose membrane. An oral fluid specimen is collected using the flat pad on the test device, followed by insertion into the developer solution. Alternatively, a finger-stick or venipuncture whole blood specimen is collected and transferred into the vial of developer solution, followed by the insertion of the test device. The developer solution facilitates the flow of the specimen into the device and onto the test strip. As the diluted specimen flows through the device, it re-hydrates the protein-A gold colorimetric reagent contained in the device. As specimen continues to migrate up the strip, it encounters the T zone. If the specimen contains antibodies that react with the antigens immobilized on the nitrocellulose membrane, a reddish-purple line will appear, qualitatively indicating the presence of antibodies to HIV-1 and/or HIV-2 in the specimen. The intensity of the line color is not directly proportional to the amount of antibody present in the specimen. Further up the assay strip, the sample will encounter the C zone. This built-in procedural control serves to demonstrate that a specimen was added to the vial and that the fluid has migrated adequately through the test device. A reddish-purple line will appear in the C zone during the performance of all valid tests, whether or not the sample is positive or negative for antibodies to HIV-1 and/or HIV-2. 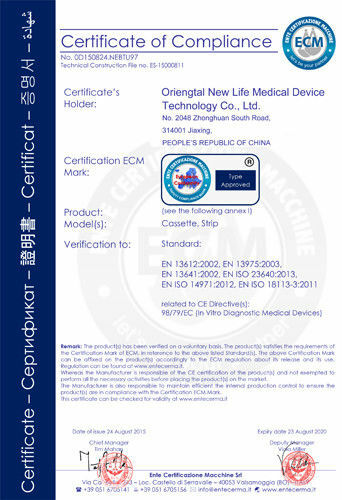 The test results are interpreted after 20 minutes but not more than 40 minutes after the introduction of the test device containing the test specimen into the developer solution. Before test, please gargle gently with warm boiled water, do not drink or eat for half an hour before collect specimen. Place the flat pad above the teeth against the outer gum. Gently swab completely around the outer gums, both upper and lower, one time around, using the flat pad. Do not swab the roof of the mouth, the inside of the cheek or the tongue. Carry the flat pad to the test stand and insert the flat pad into the tube of developer solution. Be sure that the result window faces forwarded, the flat pad touches the bottom of the developer solution vial. Do not cover the two holes in the back of the test device after placing it into the developer solution. Doing so may cause an invalid result. Leave the test device in the developer solution vial and start a timer. Do not move the test stand, or remove the test device from the vial once the test dev9ice has been inserted, until you have read the results. Read the results after at least 20 minutes but not more than 40 minutes in a well-lighted area. Read the results: Note whether there is a band opposite the “ C” AND “ T” area. HIV Oral fluid self test kit Controls are available separately for use only with the HIV Oral fluid self test kit. The Kit Controls are specifically formulated and manufactured to ensure performance of the Test, and are used to verify your ability to properly perform the test and interpret the results. The HIV-1 and HIV-2 Positive Controls will produce a reactive test result and have been manufactured to produce a very faint Test (“T”) line. The Negative Control will produce a nonreactive test result. (Refer to Test Result and Interpretation of Test Result section below.) 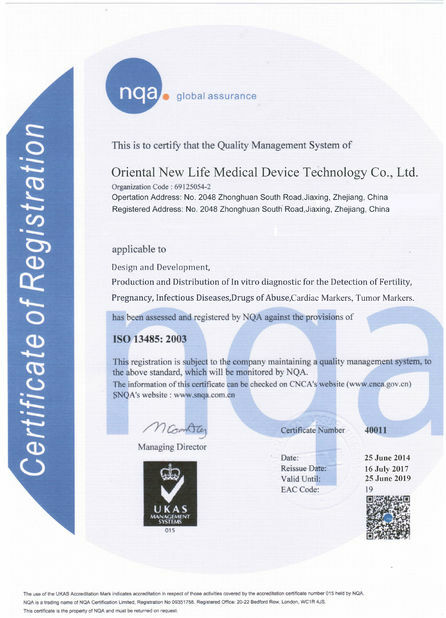 Use of kit control reagents manufactured by any other source may not produce the required results, and therefore, will not meet the requirements for an adequate quality assurance program for the HIV Oral fluid self test kit.